The experience of Venice can be found on the Las Vegas strip. Festive and full of life, the Venetian boasts beauty and elegance throughout its 4,027 all-suite hotel. No detail was left to chance when the Venetian was built. Extraordinary paintings grace the ceilings, while fine marble lays the pathways. Waterways with sailing gondolas where visitors are serenaded by gondoliers weave in and out of the property. Venetian encompasses luxury. The 500,000-square-foot Grand Canal Shoppes presents a shopping experience while five-star restaurants from celebrity chefs such as Emeril Lagasse, Wolfgang Puck, and Thomas Keller promise to give your tastebuds an entirely new experience. 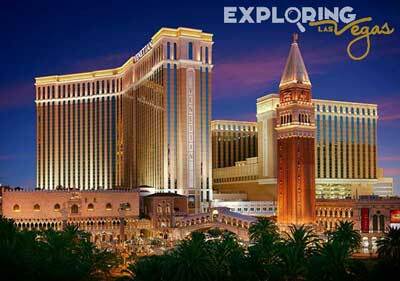 When looking for entertainment, Venetian is home to the famous wax museum Madame Tussauds and the Guggenheim Hermitage Museum, a display gallery. Live entertainment at the Venetian Hotel Las Vegas includes the Blue Man Group, an innovative sound and music show. When seeking rest and relaxation, visitors can go to the Canyon Ranch Spa, the largest spa in the Las Vegas valley. When outdoors, enjoy the resort’s sparkling pools and graceful fountains. Rest and relaxation can also be found in your very own hotel suite. In the Venezia Tower, Venetian’s most recent addition, 700-square-foot suites proudly display 27-inch flat-screen televisions and large 130-square-foot bathrooms. 3,014 suites in the main tower and 1,013 suites in the Venezia tower. Yes, a ten-story parking garage. Canyon ranch spaclub, The Grand Canal Shoppes offers a shopping experience like no other, Weddings, Two standard pools, one lounge pool, Concierge service, Photography service, Business center. Dining Area, Wet Bar, Jetted Tub, Oversized Bath, Terrace, 24hr Concierge, DVD Player, LCD TV in Bath, Exclusive Express check-in with registration on the 10th floor, Personalized wake-up call, Access to 4th floor pools at The Venetian Hotel, Complimentary newspaper, Complimentary shoe shine service and more options for the three different suites which are Exclusive Venetian Suites, Exclusive Venezia Suites and Exclusive Venezia Concierge Suite Amenities, Exclusive Venezia Concierge Suite. Venetian Players Club, The Venetian Poker Room is designed with the same exquisite elegance for which this resort has become world-famous, Slot machines, live games, reserved high limit rooms, state-of-the-art race and sports lounge, Baccarat, Blackjack, Craps, Roulette, Pai Gow tiles, Pai Gow poker, 357 Poker, Let it Ride, Caribbean Stud, Big Six, Three Card Poker, Spanish 21, Casino War, Texas hold em Poker. La Scena Lounge, TAO Nightclub, V Bar, TAO Beach. Grand Canal in an authentic Venetian gondola, The Guggenheim Hermitage Museum, World Famous Madame Tussauds Las Vegas, Gordie Brown's performance, Phantom show, Blue Man Group, Jersey Boys, Wayne Brady show. I was at the Hotel Venetian on the weekend of dec.7 - 10. It is by far the best hotel in Las Vegas. When I was there I walked through all the other hotels. There were none as nice as the Venetian. When people ask me where I stayed, they are thrown back when I say the Venetian. I highly suggest to anyone to stay at this hotel while they are in Vegas. I certainly will . Thanks again to all hotel staff, personel,etc. You made my stay in Vegas an awesome experience!